It was a balmy summer afternoon when I made my first visit to the Circle City. I’ve lived in Chapel Hill and the surrounding area for a while, but I had never trekked over to Pittsboro. During this trip, I was on a very specific mission: to figure out what the buzz around S&T’s Soda Shoppe was all about. 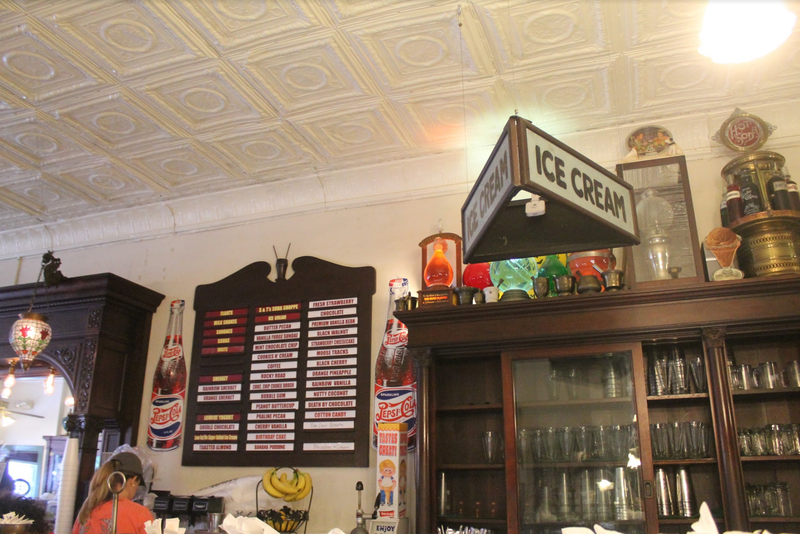 When you walk into S&T’s, you’re transported back in time to a picturesque mid-20th century soda shoppe — but not in the sort of contrived, decorative way that some dives are gussied up. From the antique light fixtures to the wooden ice cream menu, S&T’s has an unmistakably genuine look, and the food certainly mirrors that. S&T’s looked and felt like you were in a real, old-fashioned soda shop — displaying and using vintage dinnerware. We were seated in the back room, which is away from the entrance and soda shoppe counter. This room had its own charming accoutrements though, my favorite being a miniature ferris wheel that sat next to old pop bottles. The menu meshed nicely with the aesthetic of the restaurant. Bound with twine and adorned with a history of the restaurant, the menu touted pages of classics — homemade soda floats, melts, burger, salads and fries (oh, the fries), many of which were named after nearby towns or people. But what I had really journeyed to Pittsboro to experience was S&T’s banana split, listed under “frozen concoctions.” I had been told this banana split would be life-changing. At an incomparable height of around a foot, it would make all other banana splits pale in comparison. With this information in mind, I did the most logical thing anyone would do when preparing to consume a megalith of an ice cream treat — order more food beforehand. To start off, my group and I ordered a sensible appetizer: a raspberry soda float with vanilla ice cream. It reminded me of when I first moved to North Carolina and my mom, who is from the South and was excited to be back in her usual stomping ground, brought me to a soda shoppe in Charlotte and had to convince me that, yes, you can have an ice cream float that isn’t made with root beer. Suddenly, every ounce of excitement I had about this restaurant intensified one-hundred-fold. The ice cream accumulated sweet, icy edges that only a soda float can make. And if you’re worried about the concoction being too sweet, I wouldn’t — there’s something about eating underneath a collection of vintage milkshake churners and carnival advertisements that rallies your ice cream eating spirit. After the “appetizer” came the main course. Our whole party went with sandwiches: two Mebanes — classic cheeseburgers — a pimento burger with bacon and an Old Pittsboro pimento cheese sandwich. North Carolina is synonymous with a few things: Carolina blue skies, barbecue and, I would argue, pimento cheese. The pimento cheese at S&T’s would make any North Carolinian proud. It was perfectly smooth, with a bite of pepper, and managed to not be even the slightest bit heavy. Along with my Mebane, I ordered possibly the best steak fries I have ever had, perfectly crisp yet filled with fluffy potato goodness. I also had some carefully stolen curly fries and onion rings that were just as superb. If sandwiches aren’t your thing — though there are many diverse options to chose from — S&T’s offers other classics like a spaghetti plate, country ham, buffalo wings and skirt steak. Additionally, there aren’t as many vegetarian options as there are meat options, but there are definitely vegetarian options to be found in the sandwiches, main plates, salads and sides. 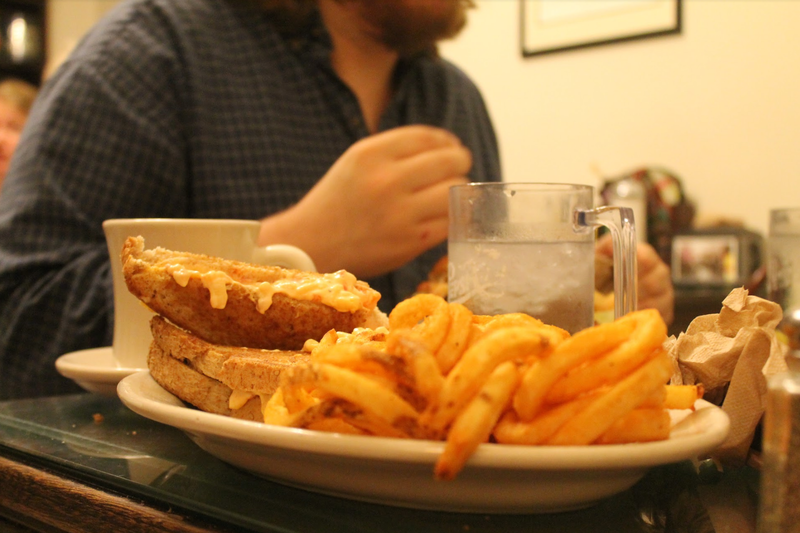 The Old Pittsboro pimento cheese sandwich, paired with curly fries, was one of an endless array of delicious combinations at S&T’s. After our main course we told our waitress we wanted to order the banana split. She seemed shocked we had eaten a full meal and were going to take on the frozen behemoth. Unfazed, we ordered a classic banana split with chocolate, vanilla and strawberry ice cream — though you can pick from a long list of flavors to create your own unique pairings. When it arrived, I realized why the waitress was skeptical of our ability to eat what we set out to. Other diners were staring at our huge frozen decision when we dug in. The ice cream and bananas were expected, but I had forgotten that a real banana split also had pineapple chunks and maraschino cherries and maybe a small shoe box’s worth of whipped cream — we had our work cut out for us. Every bite of the banana split was something unique, with different combinations of ice cream, cut fruit and, of course, whipped cream. In the midst of enjoying that beast of a frozen treat, I no longer felt like I couldn’t finish it, until, eventually, the fullness started to creep in. We shaved down the split into two average-sized scoops of ice cream with some remnants of chopped cherries and pineapples. Just because S&T’s is known for their giant banana split sundae doesn’t mean that’s all the ice cream they offer (I mean they did let us have an appetizer of ice cream soda!) Along with single and double scoops of ice cream, you can get regular sundaes, cola sundaes, malts, shakes and pie to wash down your main dish. After our feast, we walked around downtown, reveling at how much food we had just eaten and being surprised again and again by the unique shops and galleries around S&T’s. We hadn’t quite finished what we set out to eat, but I had certainly completed my mission. The buzz around S&T’s must come from a lot of directions — the food is amazing, and priced well, to boot, but there’s something more than that. 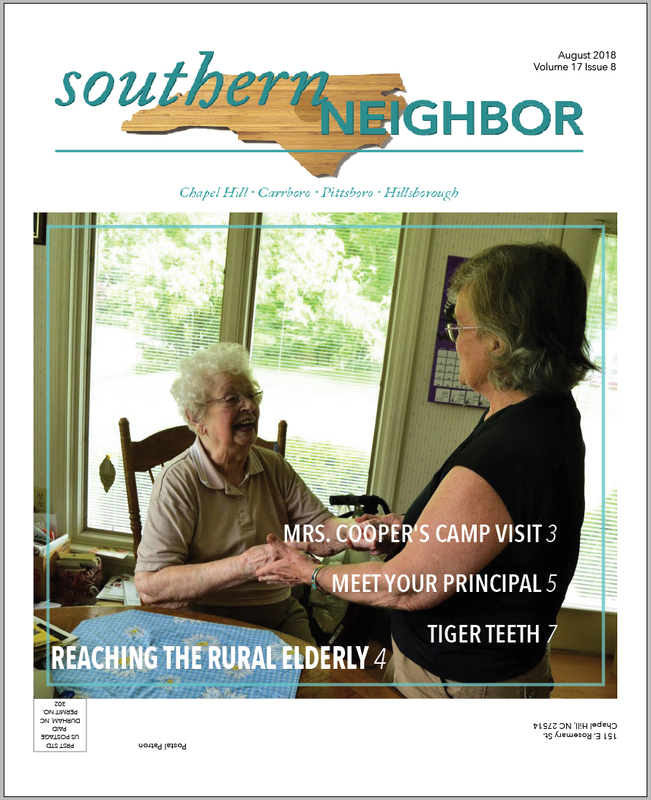 S&T’s is welcoming and warm; even someone like me who had never been to Pittsboro before felt at home there. I have one regret from my afternoon in Pittsboro — I only wish someone had warned us when we got to S&T’s that we should go easy on the food before eating their banana split, but I’ll definitely be back again for a sensibly-sized meal soon. Labor Day in NC: got plans?